Some photos of my 12' x18' DCC layout in progress. Very nice. What size curves are you running? great progress! glad you got pix posted. The radius of track is 49.5,45.0 and 40.0 - standard Atlas O 2rail. This railroad was meant for 2-6-0, 2-8-0 and B truck diesels which I think is great. BTW, Thank you Chris and Others under the Tech Support section for guidance to post what will be my first (of many) photos. I used nothing but standard Atlas O scale 2 rail track. At the young age of 60 I can truly say been there, done that with hand laid track, when you start attending too many funerals for your friends or clients its time to run trains and don't reinvent the wheel. I ask all you arm chair O scalers to get of your chair and start your layout. Your walking the walk John with an excellent example of what can be accomplish using readily available supplies. ...sadly all to many layouts exist only in the dreams of armchair enthusiasts. Great layout! I am planning another layout now. I really thought of handlaid track again but I may go the route that you have chosen. I am 66 and I want to run trains as quickly as I can. It looks as though the Atlas 2R track is in short supply right now though. I will have to do a little internet surfing today and check it out. I can't wait to see the finished layout. I'm also 66; the track plan is ready but the place is not yet available!!!! Congrats, John. Hope you have lots of fun with it. What you have so far looks great! I'm looking forward to seeing your progress. Well, I will joining the 60 club in a few short weeks, and with our last daughter marrying last weekend, we now are empty nesters. Well almost. She and our newest son-in-law are still in the process of emptying her art studio room that will be my train room. My first dedicated train room in 25 years. The planning is still in my head, but I will be starting a topic of my own here about my ideas. OK John, tell us about the RR's name. Weston, Hayley and Emmalyn - West Hayleyton and Emmaus Railroad Co. 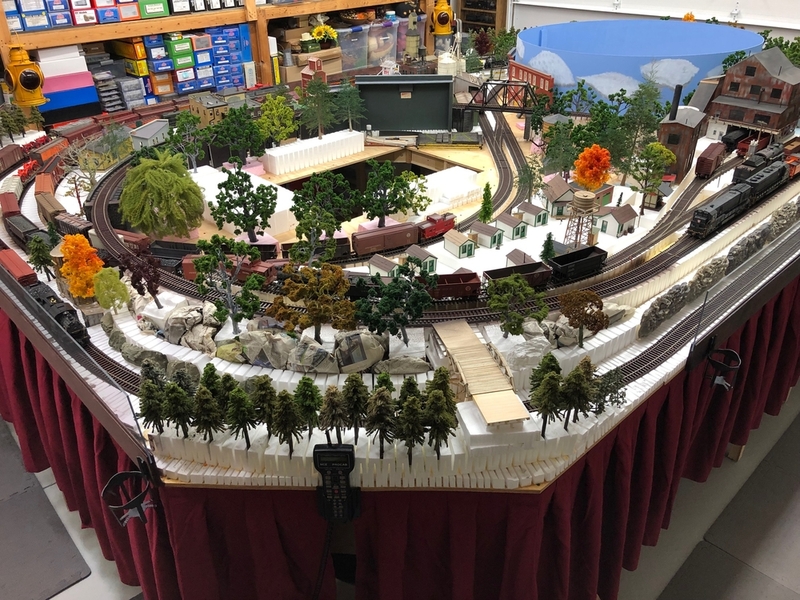 Thank you Bob,Ed and Marty- Your layouts have given me inspiration on this forum and seeing in person and would like to see more photos of your layouts to perhaps further inspire the future 2 rail layout builders. Malcolm, check with Tom Thorpe (TOM TEE) about the Atlas track-I believe Tom has a fair amount in stock. Atlas track, Mianne benchwork, Woodland scenics sub terrain riser system and scenery , NCE DCC, Frog Juicers. I'm 68 and am thinking about rebuilding the Nebraska, Dakota and Western. I am very pleased to see that you are building your own O scale railroad. Enjoy! See you at Strasburg next month. I usually get track from some of the two rail vendors. Norms O scale in Maine or Public Delivery in California. I am sure others will jump in with with knowledge of existing stock. The biggest problem IME is curved track. Use of a track bender solves that problem. I can make any radius desired. John's layout could be a great advertisement subject for several present day products. Mianne benchwork, Woodland scenics elevation foam, Atlas track products, and some recognizable buildings. As Tom stated I wanted to use the available products in O scale to show our wonderful amount of resources available which were not when I started in 2 Rail in 1984-85. The layout could not be built without benchwork being completed. I contacted the folks at Mianne in August of 2015 to get a price feel of the benchwork. They asked me to send my layout design and within one day received a detailed description of the benchwork placement and cost. Since I have attended the York TCA show since I have been 13, I picked up my 6 boxes of benchwork saving the cost of shipping and off to the races!! I was shocked to find how simple the benchwork went together-I only had to use a philips head screwdriver to tighten the cams that connect the benchwork. It took this Insurance guy who can't hang a picture only 11 hours to complete this benchwork finish to end!!!! The total cost was $1,918.00 and trust me it was well worth the money as the results show in the photos. One of the consistent knocks on 2 rail O scale is that it requires too much room. This is a nice example of how much can be done with curves approximating those of many 3 rail layouts - 080 to 099 in 3 rail parlance. Look, there are old men at 50 years and there are young men at 70 I'm in the latter (73) never let age get in the way just stop having birthdays and keep living. I've pulled half my precious layout down earlier this year and have already rebuilt most of it and I do almost everything myself as I am on a limited budget. Nice job indeed! I did much the same back in 1996. Working with a 'half basement', my curves are even tighter than yours! All my track is Atlas flex and the turnouts are Old Pullman. Radii of 40", 44" and 47" easily handle my B truck diesels, 0-6-0, 2-8-0 and 40' freight cars. The Philadelphia & Erie is basically a shelf layout, standing on 51" tall 'table top', proving 0 scale can operate almost anywhere and inexpensively as well. As you know, I also run my larger equipment at the Cherry Valley club. Hey John. Well I remember back in the day when making switching layouts was rarely out of the box. As fun as that was it was time consuming. Time goes on with much progress for RTR O scalers. While not for everyone you have transitioned gracefully into the "RTR build it (run it) while you can generation". I will be rebuilding my layout one rail at a time long after you have had many an open house operations session! I can say that All your efforts are as nice as all the switching layouts of the past years. Bravo good buddy. Run it in the best of health. Thanks for years of motivation. you did bring me into O scale. John, in the fourth or fith photo I have a question. Is that a Berkshire valley foundry building kit you assembled and weathered? It is really nice.I think I still may have one unassembled in a box that I put aside for a "one of these days"( more like one of these decades) project. btw, I am an old school guy that has set aside a few frog juicers and NCE hand held for the inevitable modernization process! I really like the sub terrain riser system. Gradual lift in elevations..cool. Great plan John. I am liking it the more I look at it. Running several trains at ease with DCC. Pierre, we go way back!!! The Linfield Northern and Southern has found a new home at Rich Yoder's house. Come to think of it, he also bought my 2x6 switching layout. The foundry you are looking at is actually the boiler house for the 3 piece Coal Mine set made by K&S(?) Models from York, Pa. and kit was built for me by Bob Ross. Neville, your layout has truly been a inspiration for many of us and someday would like to visit you in Australia- our daughter and her Navy Commander husband are now in Guam-you never know. 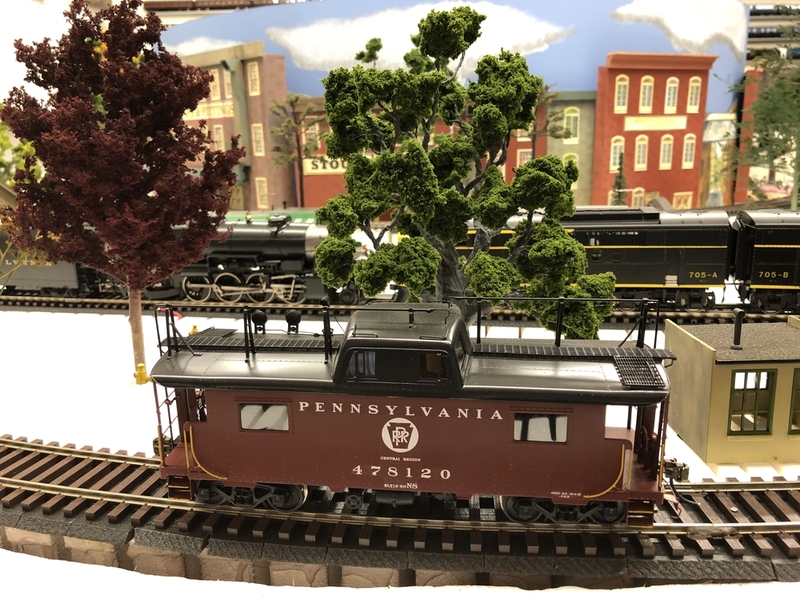 Peter, you need to show your Philadelphia and Erie layout to this new generation of O scalers as we old timers have enjoyed your urban themed layout over the years and you made me a Penn Central fan!!!! "someday would like to visit you in Australia"
John, you would be most welcome, even roster a locomotive for you. Neville(great to see you here) I will visit you with John if that's ok with you. If so, have started saving for the trip. There is a glass jar with your name on it in my workspace. John, I found the K&S kit! Looks like its on the runaway to the bench! Very nice job John. Looks good. Attached photos of progress as of 03/24/2019. New name of the railroad is West Hayleyton Avery and Emmaus Railroad Co. in honor of our new granddaughter Avery Claire Dunn. Scenery to cover foam base next on the agenda. More progress photos to come. That is a very sweet layout John, keep up the good work!! John, very nice! I like your 'circle of sky' in the middle. See you at Strasburg. I studied every view of the layout and think it will be splendid when finished. Of course, getting there is half the fun or more. John, Some great looking trees. You will have to tell us about those. Better tell them that the locals pronounce it : Em-mouse! John, Nice progress since last summer. A great example what can be done with readily available products. I think you chose a good size, something that could actually be finished. We commissioned 40 trees to be made by a Baltimore area couple Theresa and Willie who we met at the Timonium Scale show about 10 years ago. Each tree is constructed using #12/14 wire armature and covered with water putty. Theresa hand sculptured the bark , painted accordingly and finished with Woodland scenics clump material.She also did a weeping willow and a dead tree which we call "Hangman's Tree". The large pine trees were done by my friend and fellow O scaler Bruce Mohn who has created scenes at natural museum's throughout the USA. he also built the 30th Street Station structure for the Cherry Valley Club as seen in other threads. The smaller various pine trees were cleverly built using pipe cleaners by a retired NYPD homicide detective found on EBAY. 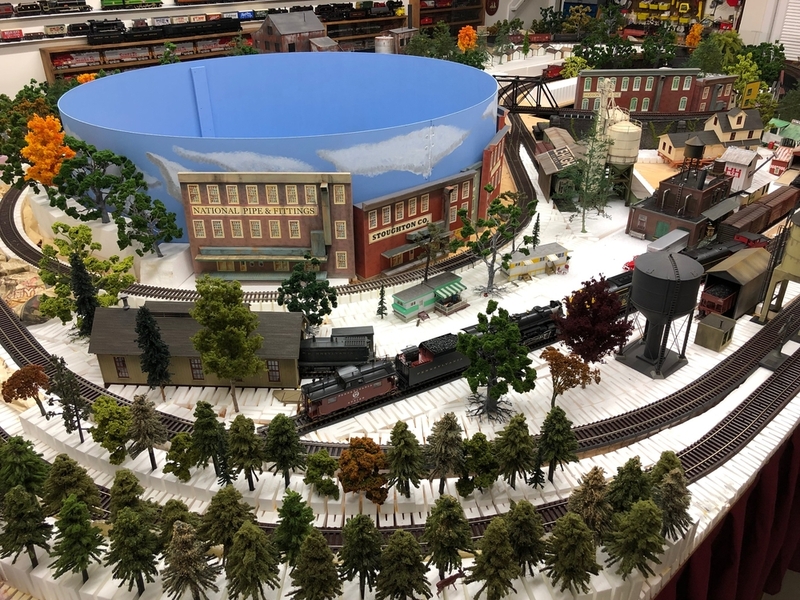 There are a few Woodland scenics and JTT trees but they are woefully small even though they are supposed to be O scale size. 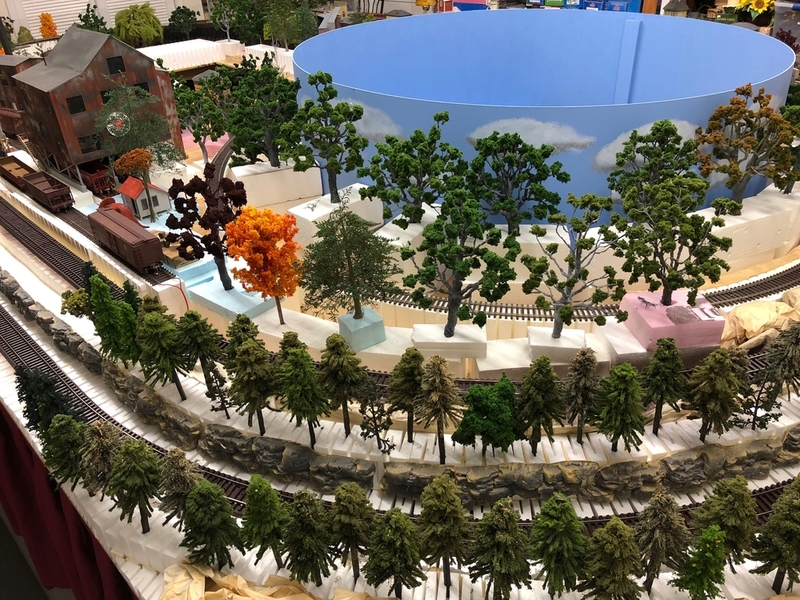 I have included some photos of the Theresa made tree size perspective with my PRR Car Works N8. 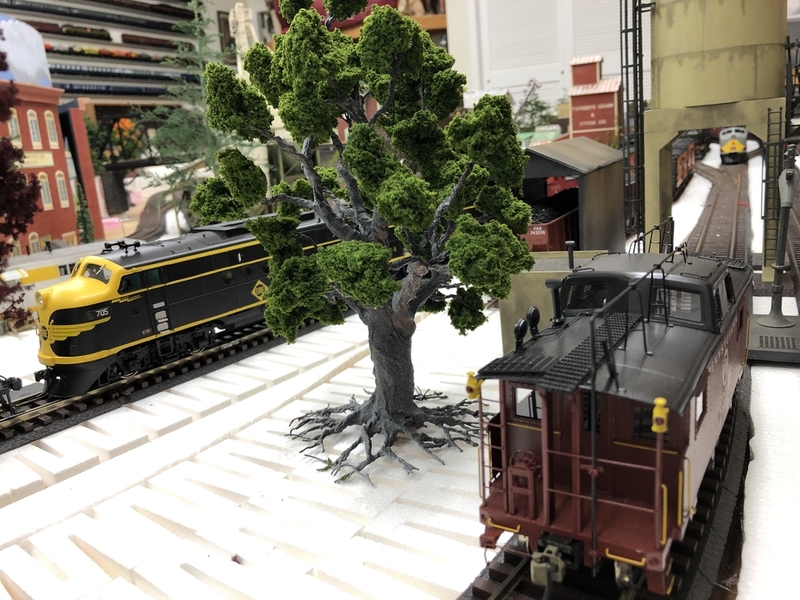 We have about 125 trees on the layout and they provide a important part of the scenic "stage" that our models travel through. Tom, you are right. I have hand laid track and other tedious tasks on my previously built modules but with todays great layout building products why bother. Life is too short !! 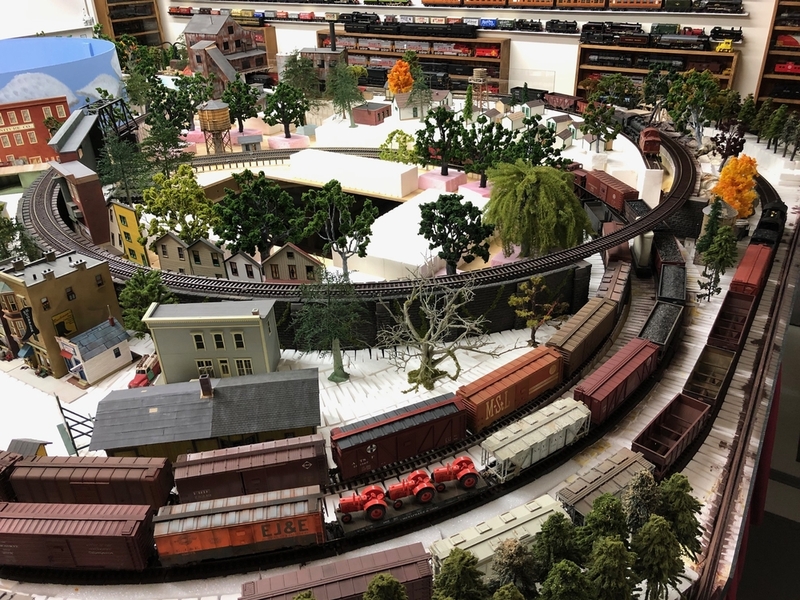 I can't wait for the 65-75 degree weather this weekend in New Jersey - open my 2 car garage(train room) door- and watch the golfers drive by-stop to see the layout-and some have missed there tee times - chasing a little white ball (s) around a golf course or playing with my trains !!! 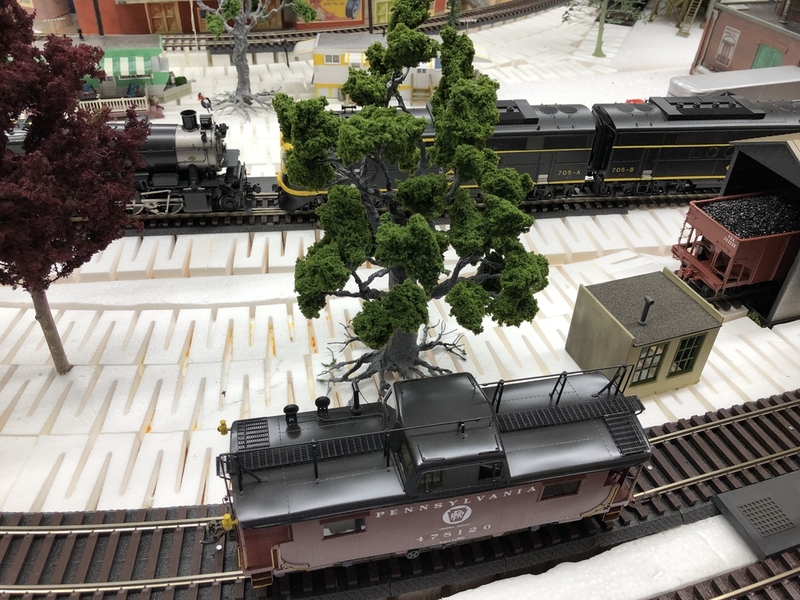 Model Railroading is the fountain of youth !!! My wife Patty and I always welcome visitors if you are in the South Jersey /Atlantic City area. 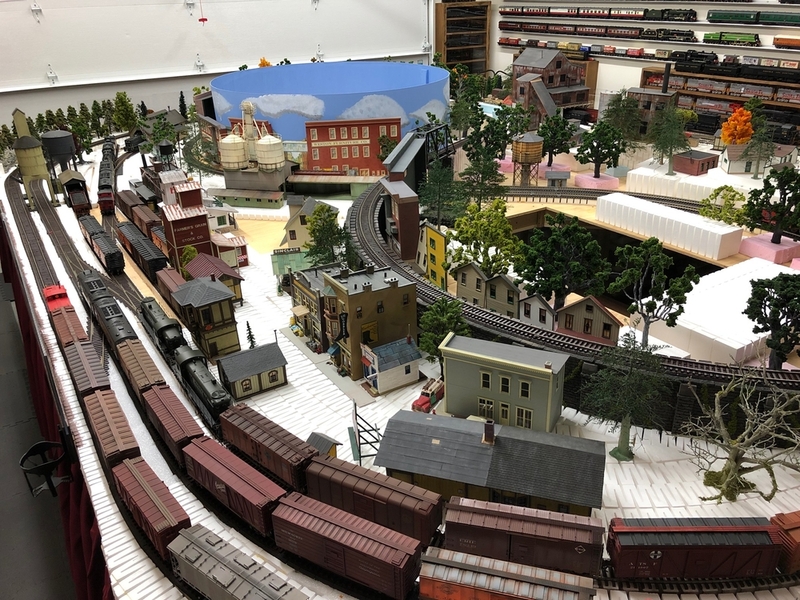 Visiting the Dunn's is like coming to the Strasburg 0 scale show April 6, both very gracious hosts. However John may have more locomotives on display.